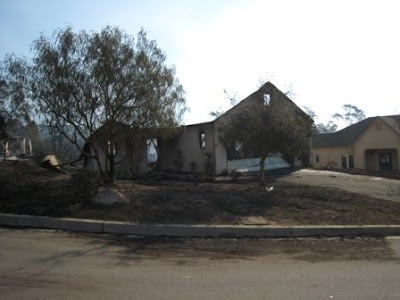 10 church families lost everything in the fires Thursday night and countless others are displaced with uncertainty awaiting them. The church staff and members have gone into high gear, generating immediate assistance checks and coordinating housing and support. The sense of deep pride I have in the staff working at a fevered pitch while I am away is overwhelming. Today the staff will make the decision about where to worship tomorrow. Westmont officials are now meeting to determine where to house students and where to conduct classes. No doubt the church will be available to them in a number of ways. Sitting in the quiet of a rainy Richmond morning (how I pray for rain for Santa Barbara!) I wonder what it means to begin again, to start all over. We have gone through a house fire in Minnesota, losing the home for 2 months and a kitchen, but not everything. We moved across country, halving our personal goods and proximity to family and friends, but not everything. We still had stuff, we carried our precious objects with us. When it's all gone, what's left? I'm guessing that these next months and years will be times when these brothers and sisters who need such immediate care right now, will emerge as the real teachers to us about what is of ultimate and lasting value. At this point the parsonage and church building are untouched by the fire. We are humbled and grateful.